FotoBella: From Trash to Treasure! ReNae here, and if you're like me, you are always looking for ways to incorporate your crafting with recycling...we in the craft world call it "repurposing" or taking an item originally designed for one purpose, and altering it to give it a new life and purpose. With that in mind, I decided that my Design Team project this week would be Altered Pringles Can! I can't think of a better way to give it new life and purpose but to cover it with the gorgeous paper from the Petal Lane paper collection by Bo Bunny! The flowers are from Bo Bunny and Petaloo. Likewise we take items laying around the house and alter them to make all kinds of home decor projects including old jars, paintbrushes, and even Pringles cans! 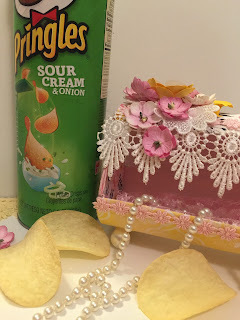 It goes from Pringles can to Jewelry box! The gorgeous Petal Lane paper from Bo Bunny and Flowers from Petaloo make this project so pretty! All you need to add is your IMAGINATION!